As I've had occasion to mention in the past, Decca's "The Singers" series, now twenty titles strong, is intended for vocal fans who love a PC or Macintosh as much as they love the human voice. When inserted into a computer's ROM-drive, each disc opens up photo gallery, a discography, and a "profile" for each singer, in addition to texts and translations of the sung material. I, for one, however, am not about to desert my listening room for the computer lab. 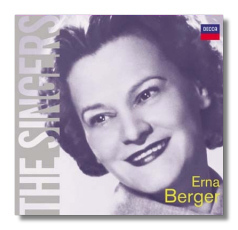 Erna Berger was born in 1900 near Dresden, and by the time she was 30, she had made a name for herself in Germany singing light soprano and coloratura roles. Her fame spread to London and then, a few years after World War Two, she was welcomed in the United States. With Jan Peerce and Leonard Warren, she recorded an excellent Rigoletto for RCA Victor in 1950 – the first operatic recording to be released on microgroove, unless I am mistaken. Most of her recordings were made in Germany, however. The contents of this "Singers" disc were recorded exclusively in Berlin, and everything is sung in German, even the selections by Verdi and Puccini. Only one track (the Rosenkavalier trio) was recorded after World War Two. In the 1930s, Berger's voice was at its freshest and most girlish. Her pitch was impeccable; listen to hear her singing next to Viorica Ursuleac in "Che soave zefferetto" (or "Wenn die sanften Abendlüfte"!) from Le nozze di Figaro and you will hear Berger's superiority in this area almost immediately. As John Steane's booklet note points out, Berger's "full range of expression is not wide," but she is more than adequately sensitive – if somewhat generalized in response – to the material she sings here. The reason to hear Berger is for her girlish (and sometimes boyish!) charm, and for the brilliance and clarity of her voice. These qualities are present in this compilation. Unfortunately, these recordings – originally made for Polydor and DG – show their age. Although Berger's voice shines through the bumpy and crackly shellac surfaces, listeners will need to have some patience. Worse, Berger's voice is given a hard, even distorted edge, if not by the original discs, then by the digital remastering. In time, this becomes fatiguing. The volume level from track to track also is highly variable. There are much better examples of 65-year-old sound technology than what can be heard here! 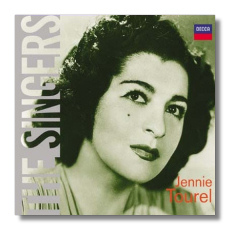 The Tourel disc is easier to recommend, even though it completely omits big chunks of repertoire with which she was associated: Carmen, operas by Rossini, operettas by Offenbach, and so on. Her golden decades in the recording studios were the 1940s and 50s. Decca does not provide recording dates for the material presented here, but these tracks seem to be taken from two LPs that Tourel made for American Decca in the later 1950s. The Russian songs are in honest-to-goodness stereo, and the remastering throughout gives nothing but pleasure – a relief, after the Berger disc. Tourel was a real mezzo, with a beautifully molded (not matronly!) lower range; she definitely was not just a soprano with a weak top! Her voice wasn't always conventionally beautiful, at least in later years, but it was consistently communicative, and dependably charming and womanly. Tourel was utterly comfortable with the French and Russian languages, to say nothing of expressing herself idiomatically in those repertoires, and so the material reissued here is characteristic, if not "the whole story." Perhaps another company will pick up where Decca has left off.